HomeEl Pescador Lodge Hosts the Filming of "Buccaneers and Bones"
El Pescador Lodge Hosts the Filming of "Buccaneers and Bones"
El Pescador Lodge is privileged to have hosted the filming of "Buccaneers and Bones" starring Lefty Kreh legendary angler, Tom Brokaw news anchor/author, Yvon Chouinard founder Patagonia, Bill Klyn director Bonefish and Tarpon Trust, Huey Lewis singer/performer, Will Benson film maker/fishing guide and Meredith McCord angler. This is the second time that El Pescador has had the honor of hosting “Buccaneers and Bones”; the previous time was in June of 2010.
fishing and the camaraderie they share as they search for answers on how to safeguard our environment. 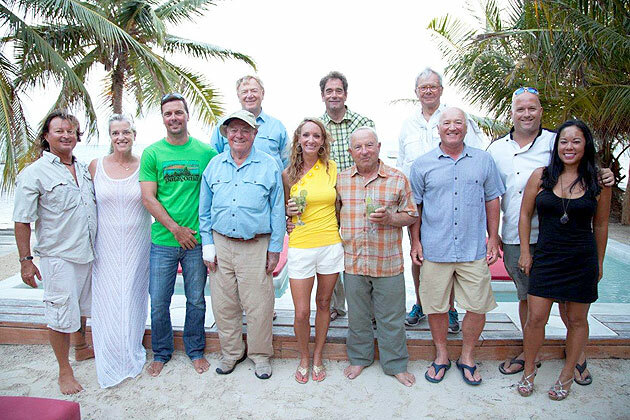 In addition to fishing the famed salt water flats of Belize, these notables are fishing for answers, too. How can we save our last great coastal environments? It's a question that has been the heart of Bonefish and Tarpon Trust's mission since 1998, and is being pursued by some of the world's top scientists. The talent enjoyed a delicious meal prepared by Chef Jeff from Rojo Lounge at their newly redesigned Rojo Beach Bar. Thank you Jeff, Vivian and Finn. They also enjoyed a fun evening in San Pedro Town attending the Fly Fishing Film Tour hosted by the Tres Pescados Fly Shop and sponsored by El Pescador, Yellow Dog, Patagonia, Sage, SA, MFC, Yeti, Ross, The Drake and TU. Thank you Wil. El Pescador would like to thank the Belize Tourism Board whose generous financial support gave Belize the opportunity to host Orion multimedia and the filming of the “Buccaneers and Bones” series. We would also like to thank Tropic Air who provided complimentary transportation; Tropic Air’s professionalism and attention to detail insured a seamless arrival and departure experience for all. Thank you to Coastal Zone Management for offering complimentary fishing licenses for the filming of the series. We would also like to show appreciation to Rojo Lounge, Belize Chocolate Company and the Tres Pescados Fly Shop. Most notably we would like to thank El Pescador’s Guides and Staff who make Belize proud; their hard work and enthusiasm are what makes Belize such a unique and special destination.